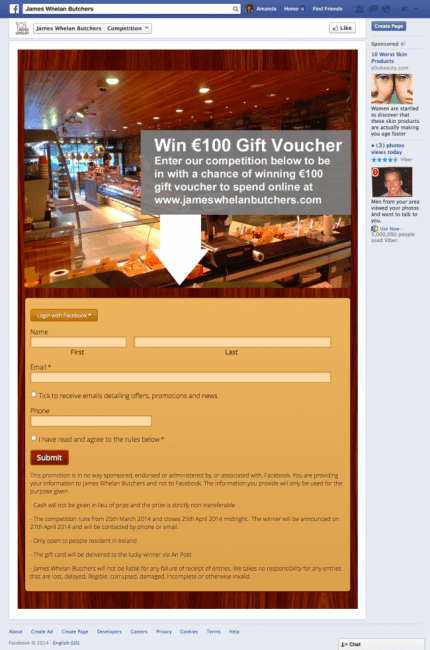 Social contests, another variation of the landing page, are contests in which visitors enter with their personal information for a chance to win some sort of prize. Contest rules differ depending on the desired outcome. Photo contests for example, prompt users to submit photos according to a theme in hopes of engaging your audience and collecting user submitted content. 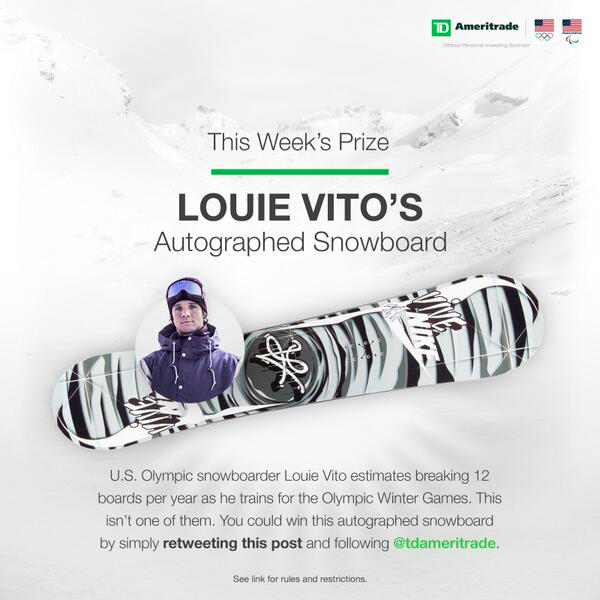 Assuming you’ve picked a great prize and targeted your audience, Social contests are an excellent way to promote your brand and collect a ton of leads in the process. 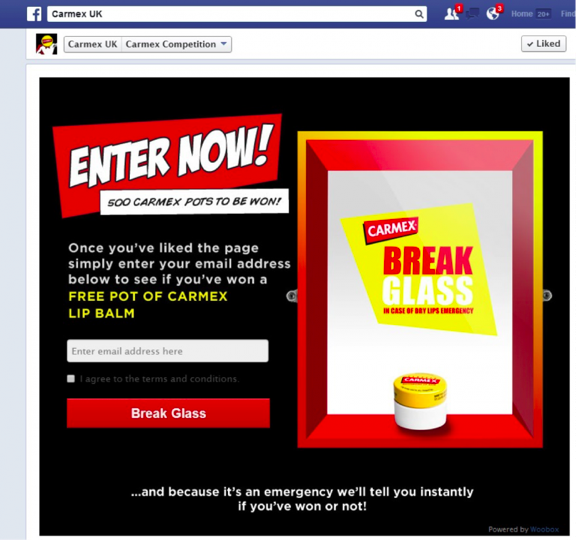 The following are examples of some of our favourite social contests. 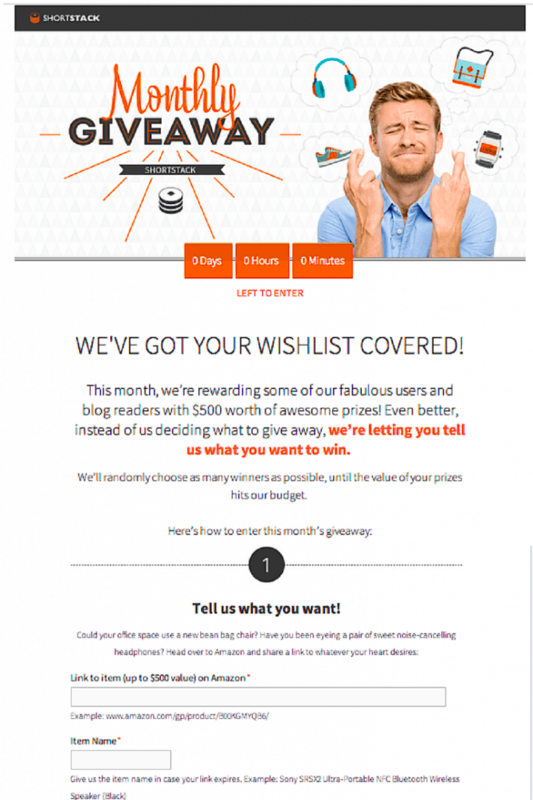 What makes this social contest landing page work? 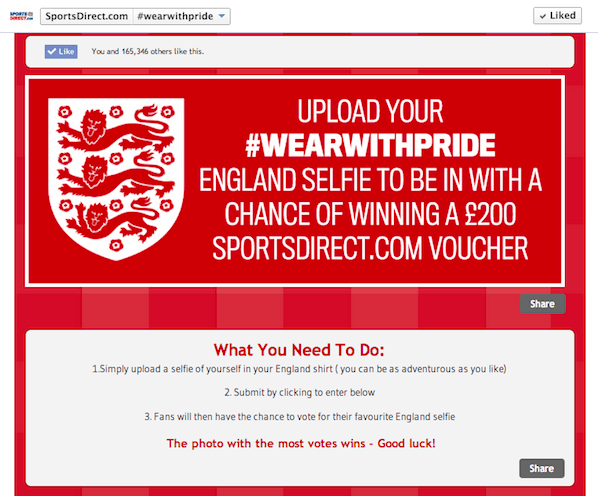 Action: A big headline ‘enter now’ prompts action. It creates excitement and commands action from visitors. The CTA ‘break glass’ is fun and lighthearted as well. Contrast: Visuals, graphics and CTAs are designed with bright colours to stand out from the ample white space. Next steps: They makes sure to let entrants know what the next steps are below. Action: The landing page provides a list of rules and guidelines for visitors. Gallery: The gallery shows off all the entrees so that people know who has entered and what the competition is like. Clear: The contest rules for entry are laid out clearly and are easy to follow. Bold: The headlines is bold and the entire page uses clear design hierarchy to present the most important information first. Imagery: The excellent use of imagery frames the contest and generates fun and excitement. Clear: The amount of winners are clear and how many prizes are picked. The contest rules for entry are laid out clearly and are easy to follow. 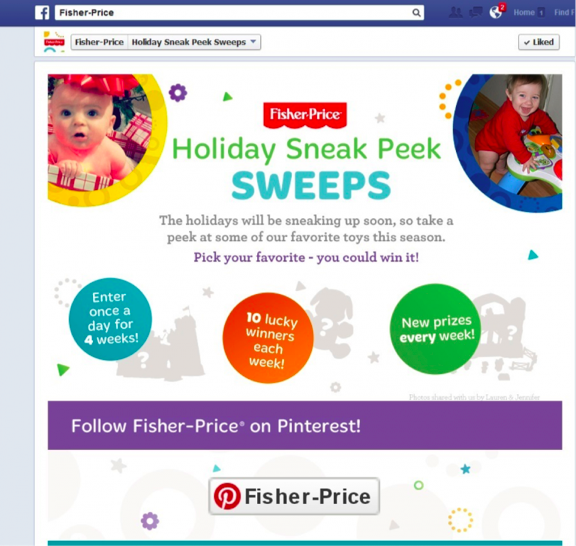 Imagery: Babies are cute and Fisher Price knows this so they use the images to add fun and excitement. Directional: A directional cue arrow points downwards to the entry form. Encapsulated: The form is encapsulated so that it stands out on the page. 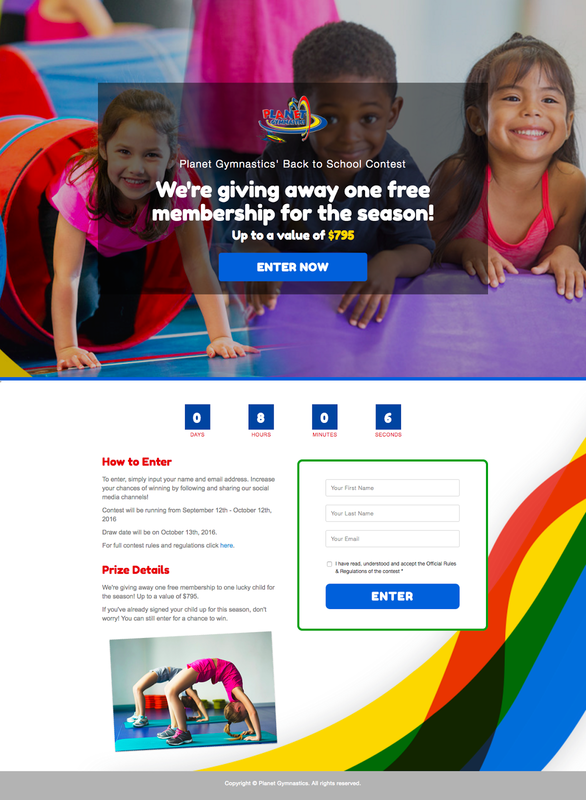 Imagery: The large image frames the contest page and directs eyes downward towards the form. Visual: Images and pleasing colours attract attention and lead visitors down the page. Well used white space directs the eyes towards areas of interest for the visitor. The large Superman logo creates excitement over participation. Imagery: Submissions are shown on the contest page to promote a more social vibe. Visual: Images and pleasing colours attract attention and lead visitors down the page. Well used white space directs the eyes towards areas of interest for the visitor. Countdown: A countdown clock makes the entry more urgent. Value: The total prize value makes the offer more tempting. Proof: Corporate logos at the top add credibility and legitimacy to the contest. Prize: A strong prize makes contest entry far more tempting for visitors. Imagery: Large imagery frames the text and focuses attention downwards towards the content. Colourful: The colour and design choice promote fun and excitement, perfect for a social contest. 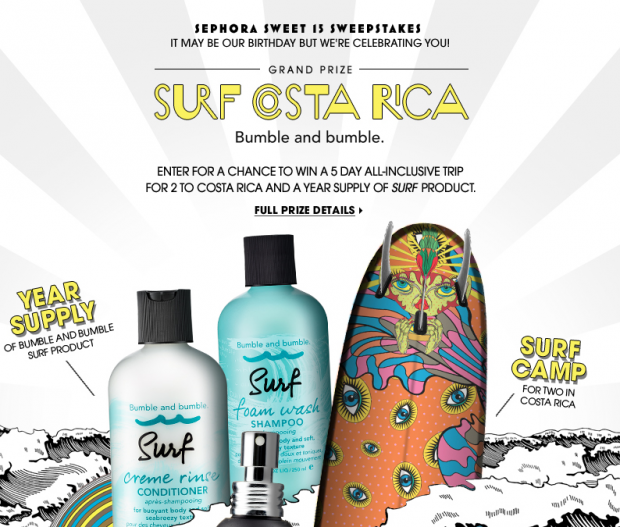 Steps: Steps for entry into the contest are clearly outlined at the bottom. Encapsulated: All the contest information is framed in an encapsulated box to contain and attract attention. 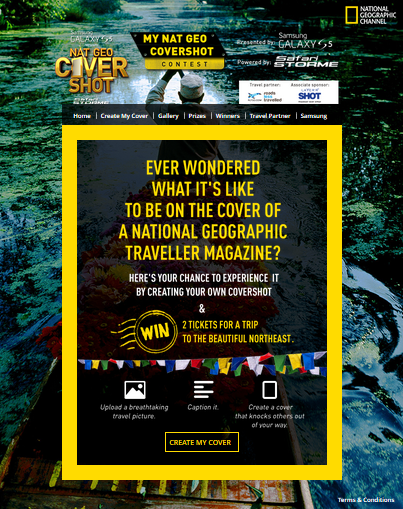 Bold: The headline is huge and bold to draw attention and direct the eye down the contest page. Steps: Step by step contest entry is clear for visitors. Imagery: Strong and vibrant imagery attracts attention and gives life to the page. Prize: The prize is a great one and makes entry hard to resist. Simplicity: The visuals take prominence on the page. Ample white space allows the copy to stand out and take focus. Value: The awesome prize and unique USP (do no laundry for a month) makes for a very compelling contest. Prizes are clearly listed on the left hand side. 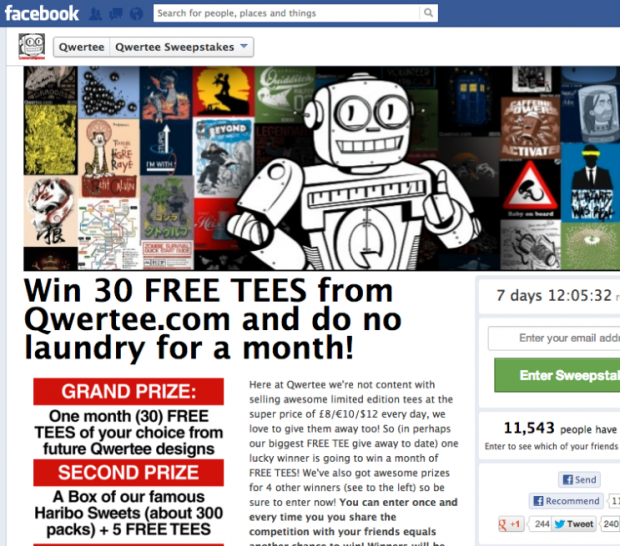 Graphics: A collage of t-shirt designs livens up this contest page and makes entry irresistible. Countdown: A countdown clock add urgency to the contest. 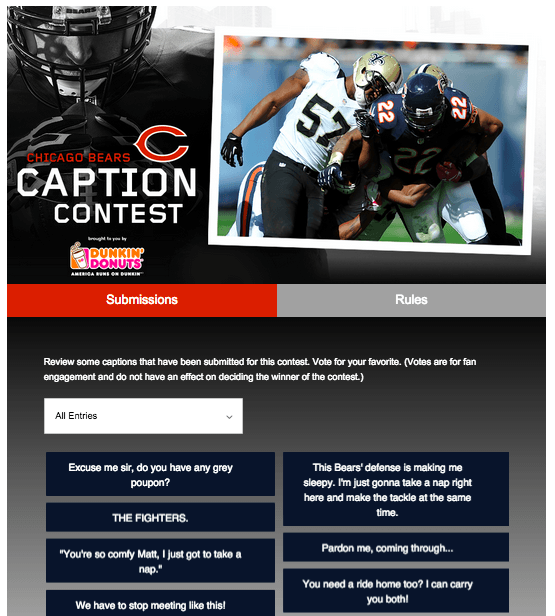 Theme: The theme of the contest sticks to the theme of the game thus fans would find it more compelling. 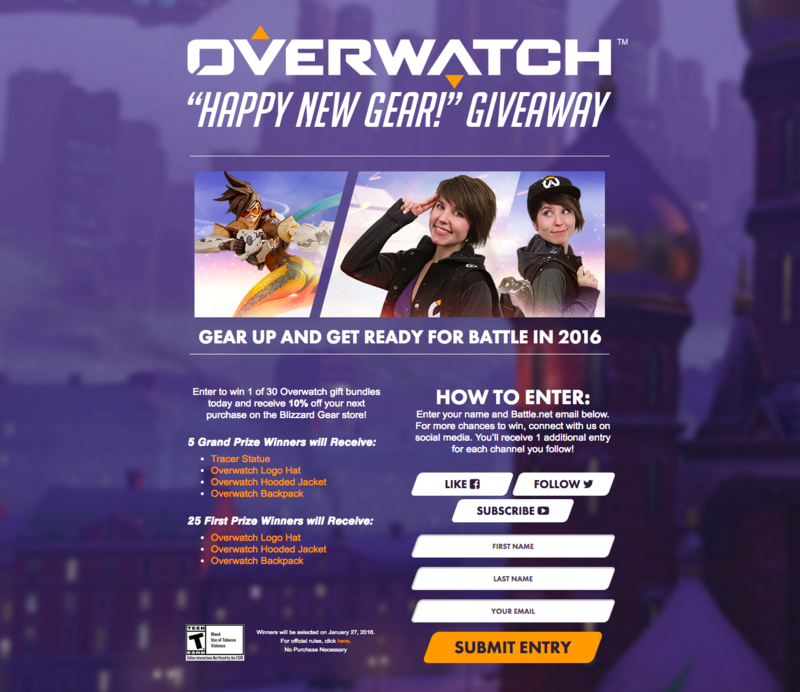 Imagery: Strong imagery of the prizes and game guide the eye towards the entry form. Prizes: Plenty of prizes are listed out for entrants. It helps to list the prizes out so visitors know what they’re getting into. Imagery: Strong imagery frames the entire page and attracts attention. It focuses the eyes inward onto the headline and the prize value. How: The rules and prize details are clearly listed on the left side and framed by ample white space. Encapsulated: The form is encapsulated in the a border and features a bright blue CTA. Countdown: A countdown clock adds urgency to the contest. Giveaway: Along with the prize, all entrants receive a free ebook just for entering. 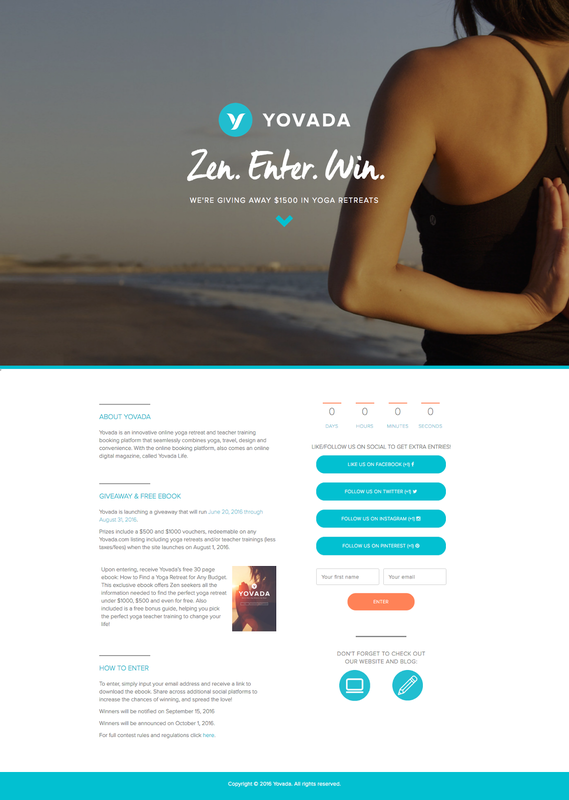 Theme: The imagery, fonts, and colours all promote the theme of the business: yoga. Its compelling and hard to resist if you’re a yogi.